It is little known that roasters all have different tips, tricks, and names for the coffee their roast This means that you can’t really accurately categorize each and every roast that is out there. To help you better understand different roasts below is a guide, but the first thing to know and understand is that, roasts fall into one of the four following categories: light, medium, medium/dark, and dark. How does one choose which category a coffee falls under? Well if you guessed color, you guessed correctly! Lighter roasts and colored coffee tend to have an accompanying lighter taste, whereas dark roasts (on the other end of the spectrum) have a strong flavour and a more aromatic smell/taste. One common misconception is that darker roasts mean more caffeine, which is actually untrue; lighter roasts are ironically more concentrated with caffeine. 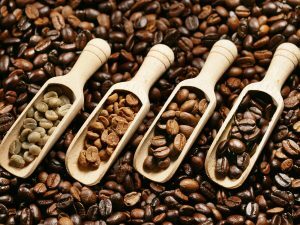 Your preference and many people’s preference in roast or coffee type, is influenced by a number of factors including your social circle, culture, personal taste, and the availability in your country/region. It is important to understand that that there can be monumental differences between roasts. The color is lighter because the beans are not roasted for as long, meaning there is no time for the beans’ oils to make it to the surface (hence the milder flavor). This coffee tends to be easy drinking. This is synonymous with ‘American Roast’ as it is the most common roast. This is an aquired taste, and is more European. The dark colour and oily surface result in a very strong flavour with an after-taste that some people love and some people hate. Medium/dark roasts are more bittersweet, whereas dark roasts are simply bitter. This is a roast that is worth asking about before you buy it, because the names and tastes can be deceiving.